If you didn’t see our last blog post (you should go over and read it right now!!) you will have missed one very exciting announcement! This week marks the beginning of our newest giveaway, #StackedWith. This giveaway is being kicked off by the wonderful HANNAH Jewellery! Here is a sneak peek of some of the items up for grabs this week! 1. We love your jewellery pieces, can you remember back at what age and how you became interested in jewellery? I’ve always felt more attracted to jewellery and accessories rather than clothes. I would always make my way to the jewellery stands in shops and bypass the clothes! Right back to making pasta necklaces and being obsessed with matching best friend jewellery at Primary School. I really focused on my interest in it when completing my A-Level Art where for my final piece I created giant pieces of jewellery and painted on them. 2. Where do you get inspiration behind each of your jewellery pieces? I take inspiration from everywhere. Although I follow current trends and styles in some of my pieces, I definitely have a love for classic silver styles and simple handmade designs. My friends inspire me massively. I’m always looking at the jewellery they’re wearing, both on an everyday basis and as occasion pieces and I really enjoy making little tweaks to designs that already exist and making them a little different. The real inspiration behind the concept comes from wanting to own jewellery that is individual to the wearer, I always hated being in the same outfit or wearing the same jewellery as someone else, it completely took away the meaning for me. So creating my pieces enables me to ensure that doesn’t happen again, each piece is made to order and so will never be the same as the last, ensuring it’s unique to it’s owner. 3. From reading through your blog posts we saw you ended up going down the sports route initially, where or what was the turning point when you decided to follow your jewellery passion as well? I think the amazing support system that my friends and close family provide helped me see that my jewellery could be taken to the wider market. I knew I liked making it and I liked wearing it, but I never thought that other people would. I really struggled and still do sometimes, to promote and push my pieces into the world so having their support really helped me. I decided about 3 years ago that I wanted to set up a website to help my friends that lived further away view the pieces I was making and it’s kind of grown from there. 4. Where do you see ‘Hannah’ in the future; what dreams do you have for it? And is it something you want to do full time? I would love to be doing HANNAH full time! I think my ultimate goal is to have a studio, saving my poor dining room table from all the scuff marks and constant chaos that it currently is. But also to have somewhere that I can unleash all the ideas I have and not have to feel as though I’m restricted to the walls of my dining room. Just a room full of HANNAH! I’d love to see it in more boutiques and independent shops and really branch out on the bespoke side of the business. I love making bespoke pieces or collections for presents and weddings and would love to expand this side of the business. 5. Do you have any advice for people who don’t quite have the confidence to follow their passion? I listen regularly to an online podcast by Jewellery Business Expert Tracey Matthews of Flourish and Thrive Academy and she says you’ve got to embrace the fear of getting started. Which is so true, not just in the jewellery business, but in everything. There is never a perfect time to get your passion going and putting it out there. There are better times, when you’re as prepared as you can be, you’ve done your research, but there never is a perfect time. You won’t feel ready, but you are! Just go for it. Do something new with your hobby or passion everyday and push the boundaries of feeling comfortable, into that fear zone and only good things will come from it. Work hard with your concept, even when it seems as though you’ve hit a plateau, keep going. Be proud of your passion for whatever it is, however other people view it, you love it and it’s a part of you so embrace it and support it. When you’re marketing, you’re selling yourself, just as much as you’re selling your concept. Be honest, be friendly, be real and let your enthusiasm for your passion shine through. That is what people really want to see. We loved chatting to Hannah, and we are so excited to share some of her handcrafted pieces with you. 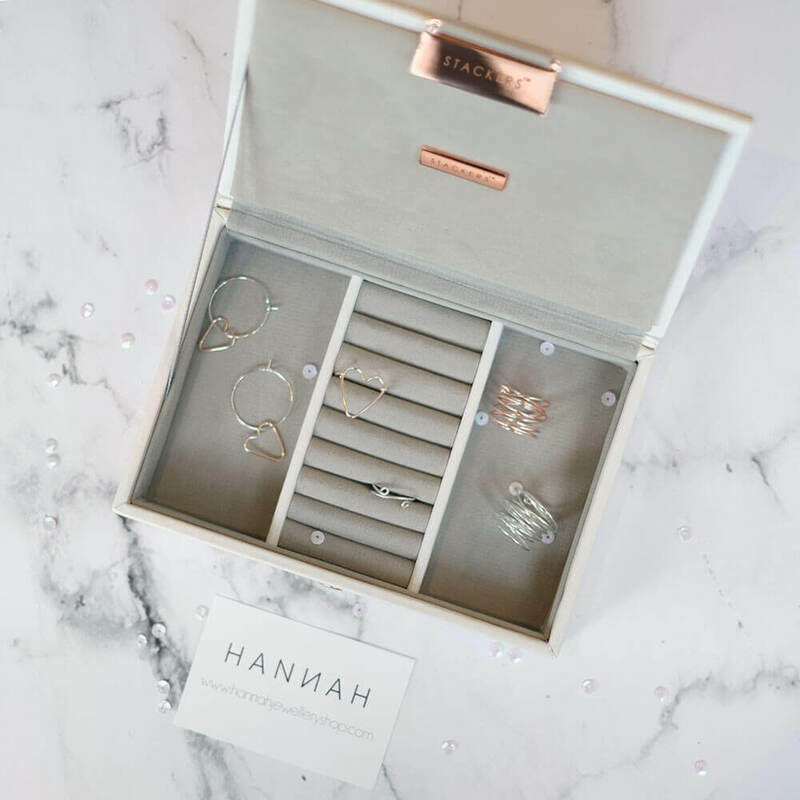 We hope that you enjoy the giveaway, and remember, if you happen to be one of the lucky recipients of the jewellery make sure you tag @mystackers and @hannahjewellery and use the hashtag #StackedWith!